Bognor claimed another big cup scalp with Chike Kandi’s 17th-minute strike enough to give them a place in the next round of the FA Trophy with a 1-0 win at Maidstone. 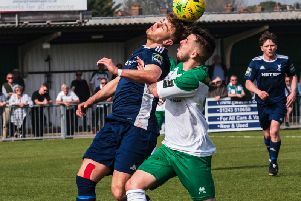 United are flying high in the National League South but Bognor added them to a list of higher-division opponents they have put out of knockout competitions this season which already had Lowestoft, Oxford City and Bath City on it. Alex Parsons and Stuart Green were on the bench after injury at a windy Gallagher Stadium. Some hard work on the right by Ollie Pearce almost teed up Kandi but the defence cleared the danger as Bognor started well on the 3G surface. James Crane’s lofted ball from the left was just out of the reach of Craig Robson in the Stones area. The first half chance for the hosts saw Frannie Collin find James Rogers on the right but his cross was intercepted by Grant Smith on nine minutes. Chad Field’s long, high pass was too much for Kandi down the right. Following a long throw by Maidstone’s Alex Flisher on the right, the ball bounced out to Matt Bodkin but his shot was well over the bar. A ball forward by Crane bounced kindly for Jason Prior who hit a cross towards the back post, but Lee Worgan was first to it. Flisher flashed a cross into the box but it was cleared by Harvey Whyte. On the counter attack, Kandi pounced on keeper Worgan’s mistake outside his area to round him and, from an acute angle, fire home low into the open goal on 17 minutes. Flisher was causing problems with his long throws and crosses and the same player won a corner on the right with another throw. Bobby-Joe Taylor’s corner found Jay May but his header glanced wide. Another long throw saw Manny Parry flick it towards goal with a header, but it flashed just over the bar on 24 minutes. Kandi tried to set up Pearce but his cross was headed out, while Robson had a fierce shot closed down. Callum Driver’s cross was well caught by Smith in the area on 32 minutes. Kandi and Pearce combined on the right and Pearce’s cross instantly found Prior but the striker’s shot rolled harmlessly to Worgan. Rogers’ fierce shot from 25 yards forced Smith into a parried save. Kandi went to ground after he had worked hard to win the ball back. Jamie Coyle was booked for the challenge. Pearce’s free-kick was gathered by Worgan. Taylor hit a shot into the turf following a Bodkin cross that bounced out to him. Smith got down well to save the effort. The second half began with Smith gathering a low attempt by Flisher from outside the box. Driver was given a talking-to by the referee after his late tackle on Dan Beck on 49 minutes. Taylor cut inside from the left after beating Whyte before shooting low but the ball flashed wide of the post. Pearce let fly with a 30-yard effort but it was straight into the arms of Worgan on 61 minutes. Flisher sent a long throw straight out of touch for a goal-kick, sparking ironic cheers from the travelling Rocks fans. Collin was puttheough on goal but his low shot was deflected by the legs of Smith on 73 minutes as Bognor began to hold on., then Worgan received a yellow card for kicking the ball away in frustration before a corner on 78. Pearce’s kick found Sami El-Abd and his header was only just off target. Crane received a yellow card for a challenge before Pearce found Prior and he let fly with a low shot that fizzed wide on 81 minutes. Flisher’s long throw ended with Stones sub Alex Akrofi heading well over. Pearce’s corner found Prior in acres of space in the box on 86 minutes but he headed over the bar when unmarked. Parry was booked late on as a scuffle involving numerous players. El-Abd also went into the book. Five minutes were added on but Bognor held on with a resilient defensive display to go into the hat for the second round.